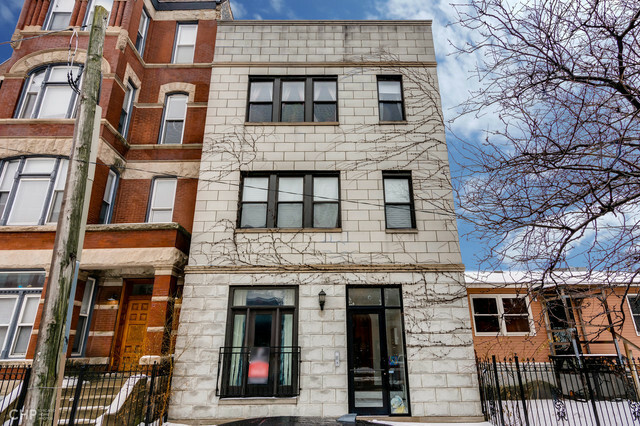 Super spacious River West/Noble Square, 3 bed, 2.5 bath, 2300 sq ft duplex featuring espresso hardwood floors, 10&apos; high ceilings, custom moldings and 8ft solid core doors. Stainless steel and granite in wide open kitchen and dining room, granite and marble bathrooms, private office with wet bar. Lower level offers family recreation area, ceramic tiled floors, work out area, private bedroom, full bath, laundry room, and huge storage room. Private outdoor deck and two tandem parking spaces. Highly desirable location close to all means of public transportation, schools, hi ways, Down Town, Grand Ave., Chicago Ave., Fulton Market, River Norh entertainments.